June 2016 was 0.90°C (1.62°F) above the global 20th century average according to NOAA – not a huge amount compared to the previous months in 2016, which were all a record also. But it still beat the previous June record, set in 2015, which is to say yeah, temperatures are still rising. No surprise here. But look at the Arctic – it was hit hard. The darkest reds are up there. And what is in the Arctic, among other things? Arctic sea ice and Arctic vegetation. We will get to that further down. The Arctic is also extremely important for the Earth’s climate and weather patterns, sea level rise, and other things: what happens in the Arctic does not stay in the Arctic, as is well explained in this blog. The period of January-June 2016 had average temperatures 1.3°C (2.4°F) higher than the late 19th century. Every single month in 2016 so far had record warm temperatures for that month. It is no surprise then – again – that it is sure looking like 2016 will be the warmest year ever, a possible La Niña notwithstanding (the probability of La Niña developing – which might lead to some cooling effect on global temperatures – has been lowered from 70% to 60%). No kidding. We are likely in for a whopper of a hot year. But… look at the Arctic again, and the sight is even more striking. For the period of January-June, it was the only area in the globe where temperatures were 4°C or 5°C above average. I don’t know about you, but I do think that is a lot of heat for a cold place. The June sea surface temperature global average was 1.39°F above the 20th century monthly average, breaking the previous record set in 2015 by 0.05°F – yeah, sea surface temperatures are also still rising. June 2016 is also the 40th consecutive June with global ocean temperatures above the 20th century average. That warm water can have various effects on the climate, directly or indirectly. In fact, warmer fall temperatures in the Arctic while the ocean is still warm may affect not only on the sea ice formation for the following winter but also weather patterns. The onset of early melt of sea ice in the Arctic set the stage for record levels of sea ice extent in the first six months of 2016. March was the only month that was not a record low. This is actually not surprising – sea ice extent has not been above-average in the first six months of any year since 2001. According to NOAA, June Arctic sea ice extent is decreasing at an average rate of 3.6 percent per decade. June 2016 was 100,000 square miles smaller than the previous record set in 2010. The warmer Arctic is leading to an increase in photosynthetic activity in the northernmost regions. The “greening of the tundra” has been observed between 1984 and 2012 (and continued since), and has been attributed to longer growing seasons and less harsh winters. The structure of the vegetation is changing, and that can have multiple effects not only on the vegetation itself but on the ecosystem as a whole. The interactions between vegetation and animals that depend on them can be severely disrupted, and the consequences unknown. These are facts not to be taken lightly, but are also a call for action. We must act now in order to prevent more changes to happen. I leave you with this awesome animation from NASA, showing the beauty of our planet that may still be spared a 2°C warming if we all work toward more renewable energy and less use of coal, gas, and oil. I live in that pale blue blob just touching the south west of Australia. And I’m really hoping its still the same colour this summer! We need more wind and solar power. And we need to stop putting carbon dioxide into the atmosphere. Why, what harm does it do? First of all, ‘record’ temperatures don’t actually mean much, do they? You see, what you conveniently forget is that ‘records’ haven’t been kept for very long. The Earth is 4,500,000,000 years old. Records from satellites have only been kept for 37 years. That’s 0.000001% of Earth’s time. That’s like me, at 57 years of age, worrying about the previous 18 seconds of my life at the moment. Now, of course, that’s a bit disingenuous – but then so are ALL the arguments coming from the warming side. You bang on about the Arctic (knowing all the while, as you must do, that the Arctic was almost certainly as warm in the early 1930s) but say nothing about the LACK of warming in the Antarctic. Of course, the lack of warming there is caused by natural variability, isn’t it? You must also be aware of plummeting temperatures worldwide – due to El Nina. The troposphere is supposed to be 1.2 times the surface temp in the tropics. Why isn’t it? Why has the stratosphere stopped cooling? The fact is with warming/cooling is that we just don’t know – and yet ‘scientists’ bang on as though we do – well we don’t. The ONLY thing we know is that despite record amounts of CO2 being pumped into the atmosphere, we’ve seen a levelling-off in global temperatures (remember, El Nino aside) for some 18 years or so, and that this was NOT predicted – and can’t even be explained now – apart from saying “natural variability” which, as we all know, is just a get-out for ignorance. I don’t know much about the climate system, and the fact is that you don’t either…no one does. The physics say one thing, while observation says another. Everyone should stop making out that we know what is going on, we don’t. Well, you specifically don’t know anything about the climate system, but you don’t speak for everyone else. There is no such thing as El Nina. There is El Nino and La Nina, but no El Nina. Saying “we just don’t know” and “can’t know” is a weak argument and is based on being willfully ignorant. That might suit you fine, but much of the rest of us prefer to learn and gain understanding about the world around us. Well, you’re just being silly now. I know a little about the climate system, and I never tried to speak for everyone else, and neither did I say “we can’t know”. Now, with that fabricated silliness out of the way, quite clearly saying ‘El’ instead of ‘La’ was just a writing error, and pedantic petulance on your part. You show your knowledge of the issue when you say that stating ‘we don’t know’ is a weak argument. I’m not stating an argument, I’m stating the actuality. I’m not offering a statement for discussion, merely stating what is so; the climate system is THE most chaotic and unpredictable system in science, and something that cannot be accurately stated. Even the physics is questionable. It’s why we cannot predict the weather more than a few days in advance. The climate system has positive and negative feedbacks that scientists don’t understand. There is natural variability, as well as ocean and wind circulation patterns that aren’t understood. If you really do think we ‘know’ then you are deluded beyond assistance. Climatologists can’t even understand why the cooling in the lower stratosphere has stopped – and that’s supposed to be a basic part of the CO2=warming hypothesis. It’s possible that there is a solar magnetic effect, but again, we don’t know! Why do you assume you know better than those that spend all their time studying this – do you really think they haven’t thought of that? You’re forgetting the 800,000 years of ice core data, and thousands of years of proxy temperature data we have. Not to mention – we have other means to determine that something screwy is going on. You’re ignoring all the layers of data that when looked at together point to a warming world that is contrary to the expected trend when only natural cycles are accounted for. Pretty sure there is an explanation for the cooling of the lower troposphere in IR absorption by CO2. But that in itself would not be a smoking gun, because we are still seeing rising temperatures as expected in a world where co2 is increasing. Foniks, I NEVER said that I know better than the experts! Why would I stupidly say that? A sign of warming is a rising troposphere temp and a FALLING lower stratosphere one. It’s not falling. We’re NOT seeing rising temperatures, that’s part of my point. We saw rising temperatures, but that doesn’t mean much – the climate is always in flux. The temperatures we saw in 2015 were caused by El Nino (remember, not my words, but those of experts). A new study links the PDO with global temps (through SST). And the PDO is heading downward, not up! So we could well have some very cool global temps coming our way until 2060, and even then they might not go back up to what we are at even now. The point I was trying to make is that people go on as if we know. We don’t, Foniks, we don’t. Warming didn’t do what they thought, it’s not doing what they thought, and we don’t know what it will do. No – that’s not right. El Nino contributed to about 10% of the temperatures this year and last. Not my words – but the words of the experts. Even without El Nino, we would have seen the highest recorded temperatures for every month since records began. Again. Not my words, but the words of the experts. As far as I can tell, your assessment of what is happening and what the scientists are saying is not the same. They are clearly telling us that we may in fact be heading for a non-linear rise in temperatures, and it’s not going to get significantly cooler over the next 50 years. Even with the supposed approaching Maunder Minimum, that’s going to reduce temps by a fraction of a degree, not enough to offset the increased temperatures. The other issue is – I’ve only just read a study yesterday from NASA that says the PDO is going to be pushing warm temperatures into the atmosphere as of 2017 onwards. Most of the “warming pause” was hidden in water a couple of hundred metres below the surface in the pacific and indian oceans, and that’s about to return to the surface. So I’m not sure what you mean by “going down”. It’s going to be increasing extreme weather events and surface temperatures. You can’t cherry pick specific individual issues with climate science. The fact is even if one theory doesn’t pan out the way they thought, it doesn’t mean it’s completely wrong – it may well mean it just needs another bit of data. This is most evident when people found the “warming pause” and exclaimed “See! It’s all wrong!” – only for us to find out that temperatures HAD been increasing, they were just being stored in the ocean due to cyclical changes in the ocean currents. But the reason I suggested you seem to know more than the scientists – you didn’t have to say it. The very fact you are inferring more from specific parts of the science suggests you think you know more than they do. The big issue with this – is that it’s a very complex system. You really would have to disprove A LOT MORE than a couple of specific theories and predictions. Because even if that one isn’t right, there are still hundreds of other markers that point to CO2 as the cause for the warming, and all the other natural “cycles” are not in a position to be increasing temperatures. If it’s not CO2 that is causing the warming, you’d have to propose another mechanism. It’s clearly warming (our icecaps are vanishing, we have lost thousands of glaciers across the globe, cloud formations are migrating to the poles, ocean temps are high, ocean acidification is increasing (another clue that CO2 is the issue)). So if it’s not CO2 – what’s causing it? What is the alternative hypothesis? Oh dear! The effects of El Nino saw record temps, but the giveaway in that sentence is the sentence itself. Record temps were caused by El Nino. In other words, WITHOUT El Nino, there wouldn’t have been record temps! I can’t make that any more plain for you. And we aren’t going to get anywhere in this conversation if I give you links to NASA and scientific papers, you give me the joke that is the skepticalscience website! I could just as well give you WattsUpWithThat. Why does anyone go to skepticalscience? Do you see now? “…may…” Exactly, we DON’T know! Then you go on to say that warming was hidden! ‘Warming’ doesn’t (cannot) hide. You’ve been reading the skepticalscience website again. And I don’t cherry-pick anything (couldn’t you have gone the conversation without using the warmist’s very favourite saying?). I simply state that we don’t know. There are a whole set of metrics that contradict what we are asked to believe. You point to the Arctic, I point to the Antarctic. You point to glaciers, I point to the troposphere. Then you use the term ‘ocean acidification’. There is no ocean acidification – look it up. That shows your reading material again – you have to stop doing this, you’re simply reading stuff and believing it. Instead, do research. ‘Ocean acidification’ is a deliberate, emotive term. In fact, ‘acidification. means to turn something acid (again, go look it up). But the oceans are merely a tiny, tiny fraction LESS alkaline, NOT acidic!!! But warmists like to use emotive terms, like ‘hottest ever’ (when they mean ‘on record’), or ‘consensus’ when history shows us that consensus in science has a habit of coming back and biting it. ‘Icecaps vanishing’ (you used that), when they clearly are not! We ‘think’ we know the physics of CO2, but can’t explain why some things are NOT happening. We don’t know the positive and negative feedbacks, and we’re completely unsure of the future because we don’t understand how the climate system actually works, and how much effect solar influences have. So in short, we don’t know! I don’t know what you’re talking about – like I said, they pegged it’s influence at about 10% – which means, the majority of the contribution of the record temps, certainly in 2016 have been from background warming. As for the “may” thing – well, that’s just BS – scientists always hedge their language, because you can’t be absolutely sure in science – but you can be very, very confident. So here is my summation – scientists are very very confident we are seeing unnatural global warming right now. In fact I just read a study today from NASA where they have validated a number of climate models using historical data and new techniques to determine the amount of heat being trapped on the planets surface. The models currently being used have an error rate of about 3%. And they concur – we are in trouble. BTW – that graph is not useful for what you are trying to demonstrate. You are using a single icecore which is located in a single region to try and determine the entire globes temperatures. It’s a cherry picked example. There you go again, “cherry picked”. You people just can’t help yourselves, can you? It’s either ‘cherry pick’ or ‘warmest ever’ or ‘consensus’. Why do you cherry pick the last 30-40 years? The graph was merely to inform you that ‘the’ warming is just another warming period – we’ve had lots. What caused the Minoan period? What caused the Roman period? What caused the Medieval period? To believe that it ‘must’ be CO2 this time, because you can’t rule-in anything else, is religious in its base. “It must be this, because we don’t know of anything else”. That’s how religions proceed. If CO2 is causing the current warming period, why hasn’t it caused massive warming in the past 18 years? Natural forces? If so, then CO2 isn’t much of a force – the climate system isn’t as sensitive as first believed…so it follows we don’t have to worry…since natural forces can overcome anything ‘we’ do. Do you see? No, we’re not in trouble. They said we would be, but we’re not. Why do you believe them this time? Go back 20 years ago, and the models suggested we’d be roasting around now (or very soon), but we’ve gone 18 years with almost zero warming! As you said, science is about being unsure, it’s about the best guess…so you’re echoing what I’m saying WE DON’T KNOW! Scientists are confident about dark energy and dark matter, yet they are remarkably elusive. I have followed science for 40 years, and I love it. But it is often very wrong. I used to be a member of Greenpeace, but I saw that they quite simply lie. The people think that we know all about climate, and that we’re heading for warming. But we don’t know. And Gavin Schmidt? Don’t make me laugh. It is cherry picked – that’s not a deflection. You have chosen a graph in a single point of the world that demonstrates changes in climate. LOCALISED climate. We are talking about GLOBAL warming. You cannot infer anything useful from that graph alone, because while there are warming events there – maybe there were massive cooling events elsewhere. I can’t tell from that graph. No one can – so what are you trying to prove? And no – you’re choosing to hear very specific parts of what I said. Saying “We don’t know” is absolutely, and utterly disingenuous. We have a very good idea, with a high probability of being right. That is different to “We don’t know”. “We don’t know” means anything could happen, and we haven’t got the foggiest. We have a pretty good idea, with a high probably of being right. There is always the chance we are wrong, but that chance is becoming vanishingly small. I am absolutely flabbergasted at your denial levels though. How do you come to the conclusion that “but we’ve gone 18 years with almost zero warming!” when we have broken the heat records almost every year for the past 15 years? This year we have the lowest level of recorded ice in the arctic ever. We had periods this year where we were 1.3 degrees celcius above the pre-industrial temperatures. The arctic circle was 4-5 degrees celcius above average temperatures. Now – you understand that CO2 isn’t the main culprit simply because we can’t rule anything else in. That’s not at all why it’s the main culprit. A hypothesis was put forward in 1897 that CO2 may cause global warming as a result of burning fossil fuels. That was then tested in labs and various experiments to determine whether that was feasible. It was. So over many decades a model was put created and then tested to see if it had any predictive power. It did. We later built satellites that can detect the gasses that are trapping heat and by how much – and yes, they identified again that CO2 is the culprit. Other scientists checked to see if there were any other possible causes or contributors. Yes, there are – but most of their influences are weaker (as an overall contributer) than CO2 – so you mainly hear about CO2 – because, well, that’s the nature of science reporting. But to say we simply said – “It’s CO2 coz I can’t think of anything better” is utter, rubbish. It’s been fairly well established through experimentation, observation, testing and validating models (the models which just happen to have been demonstrated to have about a 3% error rate in predicting climate trends, which is pretty darn good). And one last thing – I suggest you go and research things like the medieval warming and find out what caused them yourself. Because you might find out that the Medieval warming was almost entirely localised in Europe and the OVERALL temperature of the globe was actually lower than current times. Again – apples and oranges. There is no such thing as ‘global’ warming, that’s the point you are continually missing. There’s no warming in the Antarctic. In fact, there is a very small cooling in the past 35 years. That’s odd on its own, as ‘global warming’ is supposed to be enhanced at the poles. 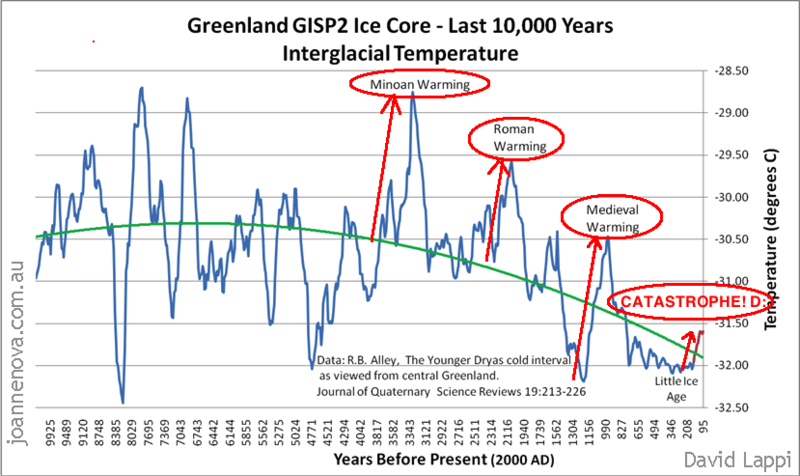 The graph shows that there has been warming events before. Didn’t you know that? But as I have just pointed out, they don’t have to be global, as this one isn’t. If we don’t understand, then we don’t know what will happen. It really is very simple, Foniks. I do know about the “pause in warming” – I also know that the pause in warming was based on a gap in knowledge at the time that could not explain where the heat we KNEW was there was going. The pause in warming referred to a “pause” in surface temperatures, but despite all the hype – scientists were not actually under the impression that warming had completely stopped. That would not be physically possible – the heat was going somewhere, and they needed to find the mechanism behind. You know… do some science. And they did – the earth as a whole continued to warm through this period, with no actual pause. But you are right that there was confusion about it – you are wrong to suggest there is continued confusion about it. If you look at warming as a measure of total energy input into the system – then the predictions were absolutely on point. And that’s all that matters – because that energy WILL return to the surface as heat (as it is doing now). Now – your assertion aboutt the antartic is an interesting one – because it’s true it’s cooled (again surface temperatures) – but it’s not true to say warming is not having an affect. The climate has distinctly changed in the area, with ice distribution shifting heavily. And we know for a fact that the water in the area has warmed, which appears to be destabilising large ice sheets from underneath. These are the icesheets that hold back glaciers from the ocean and could contribute to sea level rise. So yes – more work needs to be done here to explain why the center of the antartic is cooling while the edges appear to be warming – but it doesn’t matter how you cut it – the climate is changing there and the net result will probably be less ice. But this is the frustrating aspect of your argument. You’re quibbling about specific details – elements of the argument that are important – but don’t change the overall complexion of the issue. There IS a distinct warming trend currently underway – of the entire globe. This means additional energy is being trapped. We can visually see this through the changes in season, cloud distribution, water distribution, rising sea levels, animal migration patterns, glacial ice loss, wild fire season extension, drought extremes, polar ice loss (arctic). Lastly – you can read here about the latest research on climate models – ignore the fact it’s the Guardian – there is a link to the actual paper in the body. It’s a good read. BTW – weather and climate are not the same thing – and predicting weather is nearly impossible with any accuracy beyond 7 days. But again – weather and climate is NOT the say thing. We can say with quite a good degree of accuracy that we expect X amount of rainfall in this period of 6 months. We just can’t tell you exactly what day it will fall. And that’s why you can’t equate or extrapolate from weather reports, our ability to predict climate. I haven’t “listened to anyone” and “assumed they know” – I am well aware of how and why and by how much they can be wrong. I read the papers – and build a model of all the layers that exist. And what I keep seeing time and time again from deniers – is that they nibble around the outsides trying to find weaknesses in the data, but fail to address the fact that much of this is supported by many, many layers and types of data. It could be wrong – I agree – but is it likely to be wrong? Not really. Foniks, your Science Daily link is yet another (I did it too) ‘we don’t know’. Like I said, there is evidence that Medieval warming was global, there is evidence that it wasn’t. So we come back, yet again, to what I said, that we don’t know. However, we can safely assume that there have been past warming events that we cannot explain – yet again, because we don’t understand the climate system. I know I keep saying this, but it’s my central point. YOU think that scientists can, and you have even expressed that above. You believe that the physics and the feedbacks are explainable. As I have pointed out, they are not. We don’t understand the physics yet, and we certainly don’t understand feedbacks. For example (much-overused), more warmth could mean more cloud cover…which means reduced solar radiation…which means less warming – and so on. Again (sorry) we don’t know. What I’m trying to do is to get you out of your religious box. Believing in something, when there is no empirical evidence, is religion. You do it again with the ‘pause’. You assume that we know the incoming solar radiation and the physics of CO2 back-radiation. So the heat must be going somewhere! No, not if your calculations are flawed from the beginning. Do you see? Please note that I don’t necessarily concur with this link, I merely include it as an example. Now, I’m not denying a little warming, but our records are incredibly short. There is good evidence that the Arctic was warm in the 1930s. This was thought to be weather patterns, as I believe it is now, and nothing to do with CO2. Why do I believe that? Because the Antarctic isn’t warming. If they both were, I’d have no argument! There is, as you rightly say, warmer waters nibbling away at ice sheets, but the land mass itself is an inconvenient reminder that we don’t know what’s going on. Antarctica is a huge land mass, yet there is slight cooling. Odd? Not if you don’t subscribe to global warming, no. So there ISN’T a distinct warming trend of the entire globe. Of course weather and climate are not the same thing, I was merely pointing out that there is some science we know (like astrophysics, which allows us to make predictions five billion years into the future) and some science we understand so insufficiently that we can’t make any predictions at all – weather and climate. By the way, I’m not a ‘denier’. I don’t deny climate change, I just say we don’t know. It sickens me, as a lover of science, that there are so many learned professionals like Schmidt and Mann who make out we do. It’s great that there are still scientists who will admit that we don’t. And what I’m imploring you to do is to take a more-sceptical approach. The likelihood is that you are correct, that CO2 means warming, but it isn’t necessarily true. And the key thing is that there are things that simply don’t add. There are things NOT happening if it were true. This is THE thorn in the side of the CO2=warming side. But there are other things too. It doesn’t add up, Foniks, so we just don’t know. You do not understand models and modelling. As a computer programmer I can tell you that a model need not model everything exactly to give an accurate approximation, or to be useful. Also what you may not understand is that when you develop a model, it’s possible to verify in two ways. Make backwards predictions and match it to existing data. Make forewords predictions and match it to data that we will collect in the future. And they actually do a very good job at making solid predictions, within a few percentile of the actuals. And lastly – if you follow the work done on models, there has been some seriously amazing work done that have allowed the inclusion of far more low level simulations. But I’m not sure why you assert they don’t factor in clouds – there are a number of models that absolutely do factor in clouds. That’s a weird assertion. Here is the issue. We have measured from satellites, both US and Japanese satellites, a decrease in heat being emitted from the earth at the frequencies corresponding to CO2 and other green house gases. This indicates the heat is being trapped by these gases in the atmosphere. This directly correlates with observed increased temperatures on earth. We have also measured at the same time, an increase in downward long-wave radiation (there are a number of good papers on this), that also directly correlate with the other observations (and are what you would predict if they were correct). So it seems – that we have real world observations that while maybe the explanation is not fully understood (i’m not sure that’s true – but let’s assume it is) – ACTUALLY EXIST – and are directly contributing to the warming of the planet. This of course is also exactly what one would expect if CO2 was the primary cause. So here’s a thought experiment for you – what do you think would happen to the temperature on earth if we removed all the CO2 from the atmosphere right now? I say again, we don’t actually fully understand the physics of CO2, nor do we understand the feedbacks. We have gone from 280 ppm to 400 ppm, yet the temperature has barely risen over 1 degree C! This is because adding more CO2 doesn’t result in an equal amount of warming. If you have a window, and add a net curtain which reduces the light by 20%, adding another net curtain won’t reduce the light by another 20%. If it did, you’d only need five net curtains to act as a blackout curtain. But that’s not how CO2 works. And then there are feedbacks that we don’t understand. As I said before, adding more CO2 could increase cloud cover…which would reduce the warming by filtering (and reflecting) incoming solar radiation. It’s not as clear cut as truly awful websites like skepticalscience would have you believe. If climate models were as accurate as you think they are, then the 18-year pause in warming would have been predicted. But all models get fed with is the stuff that feeds mushrooms. Have you seen this? Couple of things – you are correct, the temperature will drop. And yes – the historical correlation between CO2 and temperature is more complicated than many people realise. However, it’s not a mystery. It’s related to lower energy output from the sun based on earths orbit, and the physics of the sun. So yes, a higher historical CO2 level may have in fact resulted in lower temperatures on earth. This is understood. But given that right now, over the current time scale those things aren’t changing – that is why there is concern. Regarding the CO2 / temperature correlation – you may be forgetting the lag between CO2 entering the atmosphere and the full effects being felt. One of the lovely things about CO2 (and one of the things that has allowed us to ignore it for so long) – is that we have hit a very dangerous 400ppm of CO2 in the atmosphere. A level we, as the human race have never had to contend with. And yet – everything seems reasonably okay right? Sure – but it takes about 30 years for the effects of that CO2 to really hit. The weather extremes we feel now – is the result of the CO2 in the 80’s and 90’s. I am aware there are some denialists who take the opposite view (that temp precedes CO2), but they always seem to ignore the role the earths orbit plays in the temperatures on earth. I’ve never found that position convincing because they always hand wave away the explanation. The cloud cover is an interesting one – but possibly a red herring. This is all too often an argument brought up – more CO2, more atmospheric moisture, less warming. And it’s true to an extent. Completely ignores the fact the CO2 is still destroying our oceans by increasing ocean acidity. Most of our oxygen comes from the ocean – it’ll be interesting to see how we survive when that ecosystem is destroyed. But yes – the cloud influence is interesting – but there are some things to keep in mind. Clouds are migrating to the poles, we have clear evidence of that right now. This is reducing rain fall around the equator and will move farm land north / south of the equator. We have been able to link this directly to increases in CO2 – so yeah, it’s still having a negative effect. And we are still warming – so whatever effect it is going to exert – it doesn’t appear to be doing it yet, OR it is, and global warming is much worse than we realise. BTW – I never answered one of your most intriguing statements – “there is no such thing as global warming”. Well.. yes and no. I don’t call it global warming as a rule. Because what we are actually talking about is adding energy into a system. Billions of kj into the earths system in the form of trapped heat. The end result is that we could in fact have extreme heat in some areas, and extreme cold in others (or even in the same place). The extra energy makes the interactions between the various elements of the climate system far more varied, violent and unpredictable. And that’s why most climate scientists have called it climate change since the 50’s. The media LOVES calling it global warming – and while it is actually a correct title for it, it doesn’t capture the actual outcomes particularly well. It implies everywhere is going to get warmer. That’s the not the case. We will see a net increase in temperature (that represents the extra energy in the system) – but we will see greater variability in weather events as a result. So basically the differences between the highs and lows will get wider but trend slightly (by 1-2 degrees c) towards being warmer. As long as the overall heat in the system increases – we will see strange or unexpected weather events. Micro water bursts are my current favourites. But snow in unlikely areas is one (had a bit of that in Australia over the past three years), or extreme storm events occuring more frequently, longer droughts – that kind of thing. See, you say 30, someone else says 10…we don’t actually know! There is evidence that it’s 800…as you say, in the opposite direction. I’m afraid you are still saying ‘ocean acidity’ where there isn’t a solitary place, anywhere in the entire world where this exists…nowhere. So why do you say it? It isn’t “destroying our oceans”, Jesus! In Cambrian times, the level of CO2 went up to 7000 ppm, and it didn’t destroy our oceans then, either. You have to stop saying stuff like this, it does your argument no favours whatsoever, and makes you just sound shrill. You end the paragraph with your belief that the ecosystem will be destroyed! Clouds shifting: Are you serious? Do you realise that this is just one paper by George Tselioudis?!?! It’s an analysis of satellite data. I really wouldn’t get too excited about it if I were you. This point demolishes the idea of ‘more energy in the system’…all on its own! No, this is completely and utterly wrong. What we have seen since the late 1990s is that minimum temps haven’t dropped – so it’s the exact opposite to what you say. Maximum temps aren’t increasing, minimum temps are. It’s like the temperature of the UK; Summer temps aren’t increasing, Winter temps are. Global warming is the correct term for it – simply because on the whole, the AVERAGE TEMPERATURE FOR THE GLOBE is increasing. But it is precisely because of people like you – that we need to be calling this climate change. Because that more accurately describes what is happening. It just so happens that the climate is changing due to rising temperatures AROUND THE GLOBE. Regarding CO2 – I gave the off the top of my head figure, it doesn’t indicate at all that “we don’t know”. It indicates that I have better things to do than re-read papers to try and hunt down the figures (I may have been referring to CO2 lifetime). The physics behind CO2 warming is actually not that hard, or complex, and it’s definitely not in dispute. You’re starting to get into real denialist territory here though – I actually know scientists that are observing ocean acidification in Queensland. Organisms are having difficulty forming shells due to the decrease in PH in the ocean. This is a fact, and quite easily testable. This again is not at all in question. You seem to be working on out of date information. Verb (used with or without object), acidified, acidifying. You try and use emotive language because it satisfies your lust to defile thought. If you carry on using the term ‘acidification’ when you actually mean to make something a tiny bit less alkaline, all you are doing is showing your ignorance. Whether these organisms are suffering or not, is a different argument. The FACT is that it isn’t acidification. Firstly it isn’t a ‘fact’, secondly it is totally absurd (destroying! ), and thirdly, incorrect terminology. It was an ignorant thing to state. Why do you think it was called ‘The Cambrian Explosion’? The oceans were “teeming with life”, with a CO2 level at 7,000 ppm! Out of all your comments, this was/is the most ignorant by far. So you couldn’t be any more wrong, even if you tried really hard. You seem to be working from an out of date mind! Oh, and still no word from you on why, if the climate system is being charged with energy, there is RECORD low hurricane activity in the Caribbean and the US. I’ll give you a hint; it’s because the atmosphere ISN’T being charged with more energy. If it were, there would be RECORD high hurricane activity. You believe that the “highs and lows will get wider”, and I’ve already shown you that is totally wrong as well! I guess it’s nice for you that I am giving you an education, but it’s taking up my valuable time (hence my late reply). I like a discussion, but you have to accept that a lot of what you are saying is just simply wrong, there is no other word for it. You are wrong. My best advice is to read up on the science, rather than the nonsense. Stop listening to others (even me) and do research. I did…and I was shocked. I discovered huge ignorance about CO2, about feedbacks, about climate science. No – climate change is a term that has been used since 1975 in scientific research. And it wasn’t “changed” it was simply the term that best reflected the situation. The fact that some areas of the world would cool and some would warm up has been known since pretty close to the start of the understanding of climate change. Why? Because it’s basic physics. Put more energy in, you’re going to get more extremes. There were papers in the seventies that discusses how places like England might in fact become more like Canada as ocean currents that draw warm water up to those latitudes slow down due to decreasing salinity. You’re reading way too much into a name. Because, and I’ll say this once more – global warming is NOT AN INCORRECT TERM. The term global warming has always referred to the AVERAGE temperature, not that every single place on earth will warm. That’s patently ridiculous. I’m sure you can dig up a paper here and there that may have mistakenly claimed this – but the papers I have read going back to the 50’s are pretty clear that adding energy to the system will increase global temperatures, changing the climate, leading to some places to warm, and others to cool – with the warming being the dominant trend. You are not giving me an education. You are utterly failing on every point you make. You need better education. Of course the climate is being changed with energy. That is what heat is – energy. That’s the single most un-controversial claim I could make. Yes cyclones are reducing in number. Guess what – that’s exactly what has been predicted. But severity may be higher, more frequently. Heat is energy. You trap more heat in the atmosphere, you are going to create a more volatile climate. Again – let’s just forget all this nonsense – because you are arguing on specifics and nitpicking around the edges. No warming?? Then you need to explain how Greenland has lost a trillion tons of ice into the ocean over the past four years. Stop ignoring the actual physical processes that are happening before our eyes – and address those. Explain the thawing of the Siberian tundra. Explain the increased fire seasons in Australian and US. Explain the rising sea levels, particularly in the pacific. Explain the increased rainfall in Asia, the extended droubt and longer heatwaves. The extreme cold events that are occuring in the US / England. The three consecutive years of snow in the desert in Australia (and yes – we are experiencing wider ranges of temperatures in some areas as a result of climate change). The loss of hundreds of glaciers in the himalayas. If it’s not increased warming – what is causing these things? Wrong terminology…already explained a few times to you. You repeat it, because you don’t understand it. The climate ISN’T being changed with “energy”. I have already explained that to you. You think it is, but it isn’t! Temp fluctuates, sea level doesn’t. What does that tell you? No warming means no extra energy. Your warming, that you ‘think’ is there…isn’t. You’re arguing against some basic physics here. Sea levels don’t rise when temperatures rise… No. Water expands when it is heated. That’s basic physics. Ain’t no system going to get you around that. 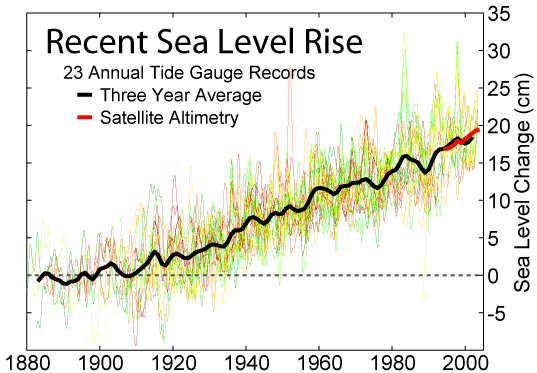 Sea level is rising. We have lost some islands already to it. The majority of the rise is higher temps. You are reading graphs wrong, inferring the wrong information and coming to the wrong conclusion. It’s all through your posts. Again – global warming. When you take an average temperature, of all places on earth. And that average is higher than the norm. It can be said that temperatures ON AVERAGE, are higher around the globe. That is all they are saying by this title. That’s it. I get your dictionary definition, but there is nothing about that definition that precludes the use of global warming – if you understand what is actually being attributed to the global part. It’s an average. And of course in averages, there will be below average temperatures. And finally – forget the troposphere. No one looks at the troposphere and says, “Oh, no warming in the troposphere… therefore those sea temp rises, and surface temp rises aren’t happening”. It is again, the combined rise in temperatures that is the issue. Not isolated systems, not just the troposphere. And finally – I have presented a number of papers in this thread, that provide pretty solid evidence that the amount of energy striking the earth has been steadily increasing – in the form of heat. Heat is energy. Energy is what makes the climate system work (at its simplest, you can describe a climate system as a transfer of energy) – putting more into will increase its instability. We are seeing that already by larger cyclones (yes, not more – that is predicted), we are seeing larger more dangerous low systems, more frequent flooding events, micro bursts, storm surges. Again – real life, very visible events. Why? The only thing that can cause this change is more energy in the system. Energy in the climate is basically heat – so where is it coming from? You’re STILL not getting it, are you? I’ve tried a number of times. Let me go again…THERE IS NO EXTRA ENERGY! Why are you failing to pick this up? I’ve given you this link already Look at the blue writing: “Global Tropical Accumulated Energy” What does the graph show you? There has been no warming within the tropopshere (and no cooling of the lower stratosphere) for 18 years. So there ISN’T any additional energy within the atmosphere. And that’s why there isn’t any increase in cyclone activity or intensity. You think there is, but there simply is not. We AREN’T seeing “larger more dangerous low systems, more frequent flooding events, micro bursts, storm surges.” What you are seeing is more reporting of them. Our records of past climate events are way too poor to make any meaningful comparison. But you ignore that. I tried to make you see this with the relationship between sea level and temperature, but again amusingly, you didn’t get it. As water does indeed expand when heated (primary school science), we would expect to see sea level rise as and when temperatures rise. If you study the links I gave, you’ll see fluctuating temperature. But, curiously, a steady sea level rise. No correlation, you see. You would expect to see sea level reduction during the period 1940 to 1970. The oceans show no such correlation. Now, what does that tell you? There IS sea level rise. It has nothing to do with warming. During periods of no warming (1940-70 – look again at the skepticalscience graph) sea level rise kept at the SAME pace. Are you starting to understand now? I’m afraid that YOU are the one who is reading graphs wrong, inferring the wrong information and coming to the wrong conclusion. It’s because you aren’t paying attention and have the basic premise wrong. There is no better example of this than you saying “Ignore the troposphere”. You probably still don’t get the irony in you stating that one sentence. In CO2-induced warming, the troposphere is EVERYTHING. And your stunning ignorance in making that remark tells every reader of this that you haven’t a clue what you’re talking about. You think you do, but you don’t. Oh – and your definition of global? That’s beyond pedantic. When you are talking about global averages increasing, and on average they are experiencing warming… then global warming is a perfectly valid term. 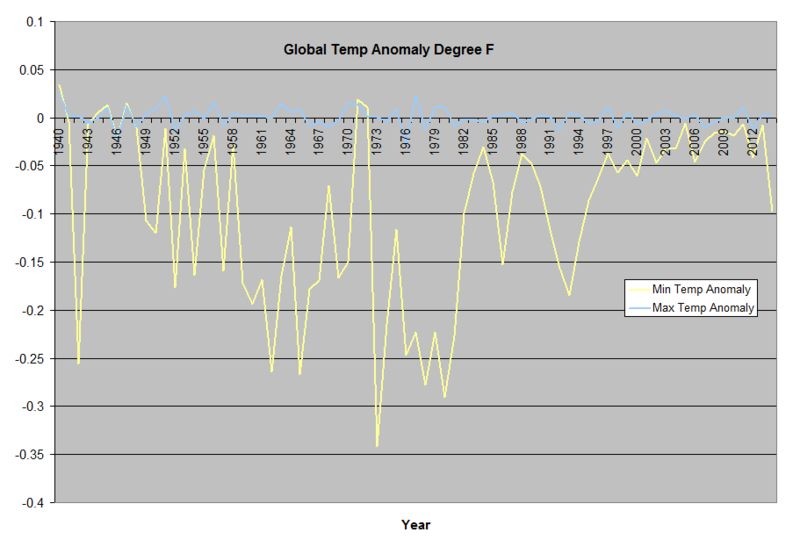 The AVERAGE GLOBAL TEMPERATURES… are increasing. As a whole, the globe has warmed on average. Ergo – global warming. What’s frustrating is that you are taking it completely out of context and trying to attribute a meaning that never existed – and then claiming they are wrong. You are a climate change denier. You are not about facts. And as a result I will no longer carry on this conversation. You have constantly demonstrated misuse of data, terminology and history in order to make your point. And as a result I cannot continue to spend time on debunking this. It isn’t MY definition, it’s the Oxford English Dictionary definition of ‘global’. It really isn’t difficult! The thing is, I’m NOT taking it out of context. What has happended during the ‘warming’ debate, as I explained, is that the English language is being deliberately warped by people like you. ‘Global’ means, quite literally, “relating to the whole world, worldwide”. ‘Acidification’ is to make something acid. Both terms are used WRONGLY – deliberately, for emotive reasons. I haven’t misused any data, as ‘data’ (again!) means a record of something. You’re not very bright, are you?